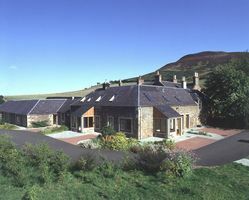 The award-winning Eildon Holiday Cottages are a converted eighteenth century farm steading forming six self-catering cottages which are located in Melrose close to the start of the St Cuthberts Way. The cottages are bright, warm, comfortable, very well equipped and situated perfectly for walking the St Cuthberts Way which passes 300 metres to the east. Melrose is a great place to stay with its lovely high street that has lots of interesting independent shops, cafes and restaurants. There are magnificent views over the Tweed Valley and surrounding countryside. Abbotsford, the home of the famous novelist, Sir Walter Scott, lies within four miles and in the area there is much of interest for naturalists, historians, gardeners, architectural enthusiasts and sportsmen and women. The wonderful Scottish Borders countryside is unspoilt and relatively unknown. It is a land of great historical interest and breath-taking beauty. Edinburgh is an easy drive or train ride to the north and the marvellous east coastline, with Holy Island and the great castles of Northumberland, is only an hour away. There is lots to see and do with a constant schedule of events. We have provided a setting for all members of the family to holiday together. Full week (or more!) stays, short breaks and weekend breaks are all available, and all our cottages are dog-friendly too. We have a total of 28 beds in six cottages and welcome groups of all kinds from walking parties, fishing parties, wedding parties, golfing and cycling groups and many others.